passed away in Hampton on Friday, January 5, 2001 at the age of 104. Sherry's husband, Gene Varacalli, is a member of the NNHS Class of 1962.
passed away in Newport News on Tuesday, January 9, 2001 at the age of 89.
passed away in Newport News on Sunday, January 14, 2001 at the age of 22.
of Newport News, on February 13, 2001 in Newport News. passed away on February 21, 2001 in Newport News. passed away Thursday, September 14, 2000 in Bartow, Florida at the age of 89.
are both members of the Class of 1961. Mrs. Whitcomb was a gifted artist whose paintings enriched the lives of many. to her high involvement in civic affairs and her dedication to the Jewish community in particular. She also served as president of the NNHS PTA during the 1964-65 school term. Her funeral service was held on Wednesday, April 4, 2001 at 1:00 PM at Temple Sinai. Mrs. Ellenson's nephew, Rabbi David Ellenson ('65) of California, will officiate. on Wednesday, April 25, 2001 in Newport News. she had been a peninsula resident since 1955.
of the Colony Restaurant and K & K Drive Inn, Newport News. at Sts. Constantine and Helen Greek Orthodox Church. Interment followed in Peninsula Memorial Park. on Tuesday, October 9, 2001 when struck by Hurricane Iris. on Tuesday, October 9, 2001 in Newport News at the age of 84.
in Yorktown on Sunday, November 4, 2001.
of ovarian cancer at the age of 75.
at the Hebrew Cemetery in Hampton. Ilene is married to Paul Lieberman of the WHS Class of 1961. Virginia Helfrich Parker, on Sunday, January 13, 2002 at the age of 86.
only five weeks after the death of her older son, Bubby Parker ('55). A devoted wife, mother, and grandmother, she prided herself in staying home to rear her family. 22 great-grandchildren, and one great-great-grandchild. with burial following in Peninsula Memorial Park. of her family on Monday, February 18, 2002 at the age of 77.
of Newport News, and of Rex Davis ('66), also of Newport News. Mrs. Davis began her phone company career as a switchboard operator at Camp Eustis. of group chief operator for Bell Atlantic. at Parkview Baptist Church, with burial following in Peninsula Memorial Park. on Wednesday, February 27, 2002.
and of Ronald Hatchett of Newport News;passed away Sunday, April 7, 2002 in Newport News. Mr. Hatchett was a retired general contractor and home builder. n Parkview United Methodist Church. Interment followed in Peninsula Memorial Park. at their home in Virginia Beach, after a long and valiant struggle with ovarian cancer. with special educational needs. For the past five years, she specialized in children with autism. at Peninsula Funeral Home, with burial following in Rosenbaum Memorial Park in Hampton. on Tuesday, April 16, 2002 at her home on Newport News. Mrs. Lamb was 77 years old. A memorial service was held on Friday, April 19, 2002 at Weymouth Funeral Home. to cancer on Wednesday, August 21, 2002 in Newport News. at 11:00 AM in the Somerton United Methodist Church Cemetery in Suffolk. to Waverly, Mrs. Daughtrey is survived by three grandchildren and six great grandchildren. A graveside service was conducted on Monday, September 23, 2002 at 11:00 AM. 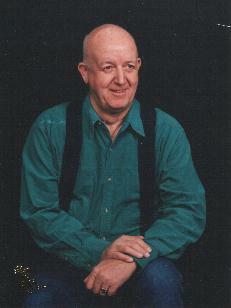 passed away in Pelham, AL on Sunday, September 22, 2002 at age of 67.
beloved biology teacher at NNHS for many years. at 12:30 PM on Friday, September 27, 2002 at Peninsula Funeral Home. The family received friends from 11:30 AM to 12:30 PM prior to the service. on Monday, October 21, 2002 in Newport News. at 10:00 AM in Peninsula Memorial Park. Edith Jones Ellis Burton, 82, passed away Tuesday, October 29, 2002 in Hampton. Barbara Ellis Williams ('61), Carolyn Ellis Coble ('60), and David Ellis ('5?). at 11:00 AM with burial following in Hampton Memorial Gardens. passed away Monday morning, November 4, 2002.
in Hampton on Sunday, November 17, 2002 at the age of 85.
on the Peninsula from 1958 until his retirement in the 1980's. at Morrison United Methodist Church, which visited shut-ins, homes for adults, and nursing homes. at First United Methodist Church with burial following in Peninsula Memorial Park. in Newport News at the age of 93. She was also very active in community affairs. at Trinity United Methodist Church with burial following in Greenlawn Cemetery. at the age of 80 after a long and courageous battle with cancer. of Becky Hudson Pasquantino of Chesterfield, VA and Tina Hudson Ellis of Newport News. at Peninsula Funeral Home with burial following in Peninsula Memorial Park. at Riverside Regional Medical Center in Newport News. A veteran of the U.S. Navy, Mr. Bass was also a 32nd Degree Mason. in York County on Thursday, January 30, 2003 at the age of 82.
with burial following in Carolina Memorial Park. passed away Tuesday, February 18, 2003 in Newport News at the age of 85.
at the Riverside Hospital School of Nursing until 1955. She then worked in private practice, retiring in 1987.
where she was active with the Women of the Church, Sunday School, and various circles. A funeral service was conducted at 2:00 PM. Tuesday in Second Presbyterian Church. died of a heart attack on Saturday, February 22, 2003. A native of Poland, she immigrated to the United States in 1928.
to Toronto, where she lived for the past five years. the Hadassa, the Ladies Auxiliary, and the Jewish War Veterans. A graveside service was conducted 4 p.m. Tuesday in Hebrew Cemetery. Shiva was observed at the home of Michael Klesmer, 302-B Patriot Lane, Williamsburg. Jewel Viola Gibbs, 87, passed away on Tuesday, February 25, 2003 at her home in Newport News. of Newport News; and of Ann Gibbs Baugh of Poquoson. at the age of 82. 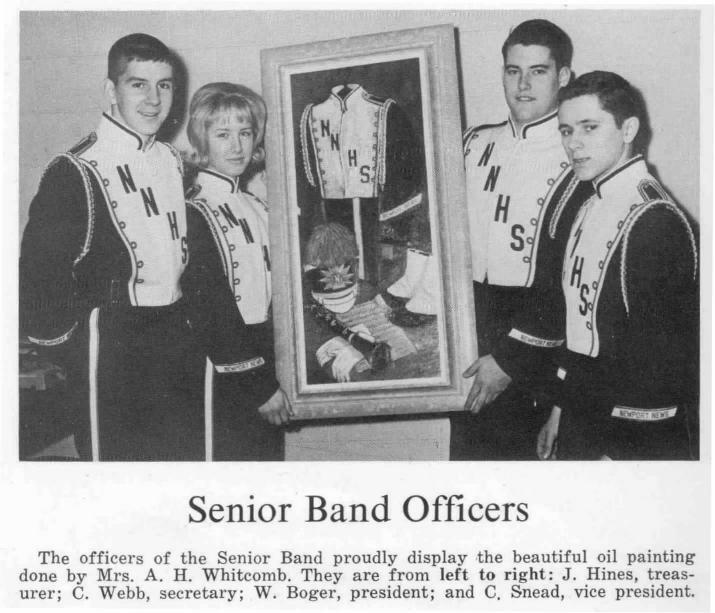 A graduate of NNHS himself, Mr. Williams was the father of Skip Williams ('60), Diane Williams McLaughlin, and Patricia Williams Boyles, and father-in-law of Larry Boyles ('64). and was a member of Bremond Lodge #241 A. F. and A. M. He was a member of Newport News Scottish Rite Temple, and served as chairman of the Trustees for 30 years. He was Master of all four Scottish Rites lodges, and was a member of the Khedive Temple. at Northside Church of Christ in Yorktown, with burial following in Peninsula Memorial Park. March 1, 2003 in Virginia Beach, surrounded by her family. She was 84. In 1962, she and her best friend, Margaret Smith, started a non-profit organization to feed and clothe children whose parents were incarcerated. Family Inmate Aid worked for many years on the Peninsula and helped hundreds of families. She volunteered with the Youth For Christ organization for many years, helping young men turn their lives around and start anew. She served as a foster parent to many, many children. She is survived by two sons, Martin W. Vellines, Jr. of Newport News, and Arthur T. Goodson of Hampton; two daughters, Betty L. Brewer of Chesapeake, and Kathy Vellines Plank of Virginia Beach; ten grandchildren; seven great-grandchildren; and a great-great-granddaughter. A funeral service was held on Tuesday, March 4, 2003 at 11:00 AM. Burial was in Parklawn Memorial Park, Hampton. a graduate of NNHS, passed away Thursday, March 6, 2003 in Newport News at the age of 83. 25 Stratford Road, Newport News. where for many years Mrs. Ruben served as president of the women's auxiliary. Burial was in Hebrew Cemetery. and David Drucker ('64), passed away on Sunday, March 16, 2003 in Virginia Beach. A native of Newcastle upon Tyne, England, Mrs. Kahan moved to the United States in 1956. She had nine grandchildren and fourteen great-grandchildren. in the ladies Specialty store, LaVogue, for over 30 years. in Hampton at 2:30 PM on Tuesday, March 18, 2003.
at 134 West Belvedere Road in Norfolk. on Thursday, March 20, 2003. Born in Johnston Co., North Carolina, Mrs. Barrett moved to Newport News in 1957. She had four grandchildren and eight great-grandchildren. with burial following in Hampton Memorial Gardens. passed away on Friday, March 28, 2003 at her home in Newport News at the age of 81. A native of Rowan Co., North Carolina, she was retired from National Linen. She is survived by four grandchildren and four great-grandchildren. A funeral service was held on Sunday, March 30 at 3:00 PM in the Peninsula Funeral Home. service was conducted on Monday at 2:15 PM in Peninsula Memorial Park. at the age of 53. He survived eleven years following a heart transplant. with the United States Marine Corps. He and Sandy have three sons and five grandchildren. in the Peninsula Funeral Home, with burial following in Peninsula Memorial Park. on Wednesday, June 18, 2003 at the age of 92.
at the high school, and the mother of Julie Wheary Lloyd ('65) of Hampton. Mrs. Wheary was very active in church affairs and several genealogical societies. at Peninsula Funeral Home, with burial following in Peninsula Memorial Park. Lula Wall Hinnant passed away Monday, June 23, 2003 in Hampton at the age of 83. David Hinnant ('63) of Hampton, and Delton Hinnant of Springfield. She had 13 grandchildren and eleven great-grandchildren. with interment following in Peninsula Memorial Park. in the James River Convalescent Center. Mrs. Miller had six granddaughters, and nine great-grandchildren. with graveside services for close friends and family at 3:00 PM at Peninsula Memorial Park. passed away Saturday, August 16, 2003 at her home in Richardson, TX. four great-grandchildren, and one great-grandchild. David Guilliams (WHS - '65) of Arlington, and Ronnie Guilliams ('57) of Farmville. in the Turrentine-Jackson-Morrow Chapel in Allen, TX. Interment followed at Hillcrest Memorial Park in Dallas, TX. and Jay Lane ('68), passed away Friday, September 12, 2003 at her home in Williamsburg. on Tuesday, September 23, 2003 at the age of 83. A 1941 graduate of the University of Virginia School of Nursing, Mrs. Bolden worked as a registered nurse on the Peninsula for 50 years. She was the grandmother of four and great-grandmother of four. September 29, 2003 at Peninsula Memorial Park. passed away on Wednesday, October 1, 2003 in Newport News. in church and civic affairs. next to her husband, Thurmond, and her only child, Rose. Donald Lee Haney, 79, passed away on Tuesday, November 18, 2003 in Williamsburg. as well as two grandchildren and one great-granddaughter. A native of Haywood County, NC, Mr. Haney had been a resident of Newport News for 55 years. Maintenance Battalion, 2nd Armored Division, seeing action in France, Belgium and Germany. He retired as a welder for Newport News Shipbuilding after 38 years of service. November 20, 2003 at noon, with burial following in Peninsula Memorial Park. was a native of Newport News. She is also survived by one grandson, and two great-grandchildren. on Saturday, November 22, 2003 in Newport News at the age of 80.
from the Newport News Shipbuilding Sheet Metal Shop in 1988.
by five grandchildren and seven great-grandchildren. on Wednesday, November 26, 2003 at 6:00 PM. Visitation followed until 7:30 PM. Burial was in North Carolina. Sara Jeffers passed away in Smithfield, VA on Wednesday, December 10, 2003 at the age of 83. Tom Jeffers of Sandston; and Jack Jeffers of Newport News. by nine grandchildren and twelve great-grandchildren. Her funeral service was conducted on Sunday, December 14, 2003 at 2:00 PM. in the chapel of W. J. Smith & Son Funeral Home. Burial followed in Peninsula Memorial Park. of Calvary Baptist Church in Newport News from 1946 to 1960.
eight grandchildren; and nine great-grandchildren. Memorial Park in Richmond with memorial services following at 2:00 PM. in the Sanctuary of Derbyshire Baptist Church, 8800 Derbyshire Road. of New York, died in Baltimore on Monday, December 29, 2003 at the age of 93.
and was active in real estate until his move to Baltimore in 1997. He was a member of Adath Jeshurun Congregation for nearly six decades. Funeral services were held at Sol Levinson & Bros., in Pikesville, MD. of New York City, passed away on or about Tuesday, January 13, 2004. She worked as an executive secretary in a number of businesses, including Colonial Williamsburg and the Virginia Highway Department. For a number of years she owned and operated the Peninsula Employment Agency in Newport News. Harry Worsham passed away Monday, January 19, 2004 in Newport News at the age of 85.
of Newport News; and Sandra Worsham McConnell ('66) of Suffolk. He and his wife, Ruth, have six grandchildren and five great-grandchildren. A decorated Army veteran of WWII, Mr. Worsham owned and operated Worsham's Used Cars. at the Weymouth Funeral Home Chapel. passed away Saturday, January 24, 2004 in Newport News. Master Sergeant and was a veteran of the Korean Conflict. Budgie was active in church and civic affairs, and was lead singer in the "Matinee Idlers". In addition to Melba, he is survived by one daughter and one stepson. at Peninsula Funeral Home followed by a visitation until 8:30 PM. A funeral service was conducted at 2:00 PM Tuesday, January 27, 2004 at Langley Christian Church. and numerous step-grandchildren and great-grandchildren. at Parkview Baptist Church, with interment in Peninsula Memorial Park. Mr. Pugh was a member of Parkview Baptist Church. 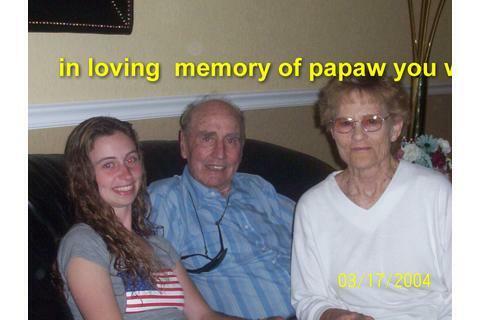 John Pugh, Jr. of Newport News; three grandchildren; and five great-grandchildren. in Peninsula Funeral Home, with burial following in Peninsula Memorial Park. on Wednesday, March 3, 2004 at the Beth Shalom Home in Richmond at the age of 69.
and Masonic activities. He is also survived by his wife, daughter, and two grandchildren. in Hebrew Cemetery on Kecoughtan Road in Hampton. on Sunday, March 14, 2004 in Poquoson at the age of 88. In addition to Allen, she leaves behind two grandchildren and four great-grandchildren. and actively engaged in civic and Temple affairs. of Kissimmee, FL; and Suzette Reighard Harrison of CO.
in 1989 from Newport News, where he had lived for over 50 years. He was a retired brakeman for the C&O Railroad, and an Army veteran of WWII. at Grissom Funeral Home in Kissimmee, FL. for 27 years, Carl was an enthusiastic radio controlled model airplane hobbyist. He is also survived by two sons, a daughter, and five grandchildren. at Peninsula Funeral Home with burial in Peninsula Memorial Park. Isidore Sandler, 87, passed away on Saturday, April 24, 2004 in Boca Raton, FL. He was the husband of the late Hannah Bromberg Sandler ('40) who died August 8, 1997.
and Janet Sandler Suvall ('71) of Boca Raton, FL, and four grandchildren. after which he owned several furniture stores in the Newport News and Hampton areas. He then worked in commercial real estate sales in Newport News for over 30 years. and also wrote many letters to the editor of the Daily Press which were published regularly. in Hampton, with burial following in Hebrew Cemetery. in Gloucester on Saturday, May 15, 2004 following a long illness. She is also survived by five grandchildren and four great-grandchildren. at Bellamy United Methodist Church Cemetery in Gloucester. one son, ten grandchildren, 18 great-grandchildren, and four great-great grandchildren. Funeral Home Chapel, with burial following in Parklawn Memorial Park. Service Medal. She was member of Temple Sinai. Marilyn Margolis Wasserman of Decatur, Ga.; four grandchildren, and three great-grandchildren. by her husband, Waldemar M. Bauz, and a daughter, Marie Bauz Holtgreve. She is also survived by nine grandchildren and seven great-grandchildren. in the chapel at Our Lady of Mount Carmel Catholic Church, Newport News. passed away peacefully in her sleep at the home of her daughter on Thursday, July 8, 2004. Born in Suffolk, Mrs. Carpini was a lifelong Peninsula resident. the Legal Secretary's Association, Peninsula Organ Club and The Sunshiners. She is also survived by four grandchildren and six great-grandchildren. The family received friends from 6:00 to 8:00 PM on Saturday, July 10, 2004 at Peninsula Funeral Home. Margie Ellen Hamilton Booker died Saturday, July 31, 2004 in Newport News at the age of 87.
of Newport News; and Bunny Booker ('65) of Fenton, MI. She had 10 grandchildren and 21 great-grandchildren. at the downtown W.T. Grants for many years. at the Weymouth Funeral Home Chapel, with following in Peninsula Memorial Park. Harry Worsham, passed away Monday, January 19, 2004 in Newport News at the age of 85. They had six grandchildren and five great-grandchildren. and had been a Peninsula resident for the past 62 years. Home Chapel, with the family will receiving friends following the service. A native of Richmond, Va., he had been a Peninsula resident since 1942.
in 1981 as Vice-President, Secretary-Treasurer and co-owner. He is also survived by two grandsons. at the Peninsula Memorial Park. James Davis, passed away at his home on Friday, September 17, 2004 at the age of 82.
of Newport News, and of Rex Davis ('66), also of Newport News, and of Vickie Davis. A worker on the C&O and later CSX Railroad, Mr. Davis was born in Halifax County, VA on May 31, 1922. The Davis' had three grandchildren. Mr. Davis was a member of Parkview Baptist Church. Visitation will be from 6:00 to 7:30 PM on Wednesday, September 22, 2004 at Peninsula Funeral Home. at Parkview Baptist Church, Hilton Boulevard, Newport News. to the deceased inherit part of the liberated soul and become richer in their humanness." "This, he said, "isn't any ordinary package." "She got this the first time we went to New York, 8 or 9 years ago. She has never put it on. Was saving it for a special occasion. Well, I guess this is it." he was taking to the funeral house; his wife had just died. I still think those words changed my life. Now I read more and clean less. I no longer keep anything. I use crystal glasses every day. I'll wear new clothes to go to the supermarket, if I feel like it. I don't save my special perfume for special occasions, I use it whenever I want to. The words "Someday..." and "One Day..." are fading away from my dictionary. If it's worth seeing, listening or doing, I want to see, listen or do it now. I don't know what my friend's wife would have done if she knew she wouldn't be there the next morning, this nobody can tell. I think she might have called her relatives and closest friends. She might call old friends to make peace over past quarrels. I'd like to think she would go out for Chinese, her favorite food. It's these small things that I would regret not doing, if I knew my time had come. Each day, each hour, each minute, is special. If you got this, it's because someone cares for you and because, probably, there's someone you care about. O res mirabilis! Manducat Dominum. at the suggestion of Dave Spriggs ('64) of VA - 07/01/03.